Students at the Operation Frontline nutrition class learn secrets to make homemade pizza healthy and tasty at the same time. With the voices of children bouncing in through open windows, a small group of women huddle around portable stoves. They squat on miniature blue chairs, taking turns talking about what brought them to Room 4 at Cesar Chavez Elementary School that day. 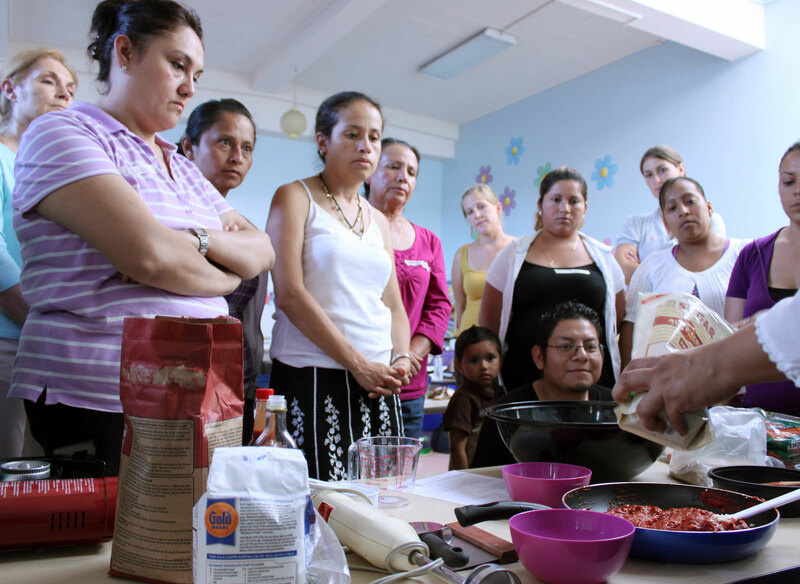 While the students introduce themselves at the beginning of Cooking Matters, a free, six-week-long course developed by nutrition nonprofit Share Our Strength to teach low-income families about healthy diets, children careen by tables and volunteers as if the classroom were an obstacle course. “Todos los grupos darnos cosas diferentes” — “All the groups give us something different” — begins Vera Simon-Nobes, an Americorps fellow who helps organize the class. Despite a willingness to divulge things like lactose intolerance, the women become shy once instruction begins, and much of the first hour is about getting them to relax. “Energia, calcio, proteina para los musculos…” continues Simon-Nobes. Energy, calcium, protein for our muscles. She crouches down on one knee to bring herself to eye level with her students. “Cosas pro-ces-adas,” jumps in Irma Sainz, one of the class’s more vocal students, helping Luce find the correct way to pronounce processed foods. The entire class giggles in understanding when Luce manages to get it right. So have many of the other 7,000 families that have participated in Cooking Matters’ lecture-demonstration classes across the country, according to organizers. “Nutrition is about psychology. It’s about disguising things with tastiness,” says chef Violeta Sandoval. The class is meant to be an exchange between peers. Sandoval, for example, is a former Cooking Matters student. And Simon-Nobes is hoping that one of the Latina students will teach her how to prepare beans so they don’t end up dry. For some, whole grains are definitely going to need some disguise. When students receive a homework assignment to replace one item at home with a whole grain, the reaction is immediate. “My daughter only eats white bread,” says Sainz, shaking her head no as if she were being asked to stop a speeding bullet or walk on water. Another student quickly remembers once giving her son a peanut butter and jelly sandwich on wheat bread. He practically spit it back out, she says. Hispanic people in general eat more fruit than most, but they tend to shun vegetables — fewer than one in five consumes the USDA daily recommendation, according to a study released by the Centers for Disease Control and Prevention in early September. Teach a Man to Fish…. Education works, according to class organizers, because it helps low-income households feel more in control of stressful situations. Share Our Strength found that 75 percent of graduates from classes like the one offered at Cesar Chavez consistently ate more fruits, vegetables and whole grains at home, according to its 2009 annual report. The average student, who seldom looked at nutrition labels before participating in Cooking Matters, uses them most of the time after. After Luce’s lecture, students begin assembling pizzas with three different types of whole-wheat crust — homemade dough, pita bread and tortillas. As Sandoval puts it, handmade gourmet pizza is great, but it doesn’t do anyone any good if the ingredients aren’t accessible. For her, it’s much more important that people are exposed to whole grains and learn what they can do with them, regardless of what exactly is used. As pizzas bake, a handful of students casually chat with each other. Others try to rock drowsy infants to sleep. Sainz and a group of mothers with children at Cesar Chavez confer about an upcoming school meeting. “Hay que ir,” — We have to go — one mother blurts out. “It’s about program cuts,” Sainz explains. Many of the students found out about the cooking classes because they are involved parents at the school. Fresh Approach, along with partners like Jamestown Community Center and Americorps, is in charge of getting the rest of the seats filled for the two remaining classes this session — one of the nearly 50 that will have been offered in the Bay Area by the end of this year. A second Mission class is currently running through November 10. Jose Cruz, the lone man in the class, sits in one corner fiercely thumbing off text messages. He admits that he first came to learn more about cooking techniques rather than to get ideas for healthy eating. But as a father of two, he recognizes the value in what’s being taught. By the time the cooks pull the pizzas from the ovens, they’re hungry. So are their children. One woman feeds her young daughter, who eagerly takes bites from her mother’s hand. What type of dough does she likes best? The child looks back with a quizzical stare. She chews, turns to her mother and gets help. “They’re all tasty,” her mother says. EDITOR’S NOTE: On the day this article was published, the name of this course was changed from Operation Frontline to Cooking Matters, and this article has been updated to reflect the change. I just wanted to let you know that as of Saturday, Operation Frontline is now known as Cooking Matters! Thanks for the press! Hi, thanks for the heads up on the name change. We’ll update the post to reflect the new name. Cheers!